Sometimes it feels like everything on the internet flies by so quickly that even really interesting things get buried in the rush to post post post. In the hopes of at least remembering some of the interesting things that are going on around the web, here’s a post with some notable links, things that you may or may not be interested in. And some shameless self-promotion (hey, it is my blog, after all). What parent hasn’t read Goodnight Moon to their children? This post addresses certain issues with the book in a deliciously hilarious way. My husband and I laughed heartily many times while reading this. Whoever came up with bad lip reading is a comedic genius. I couldn’t stop laughing at these clips from the 2015 NFL Bad Lip Reading video. 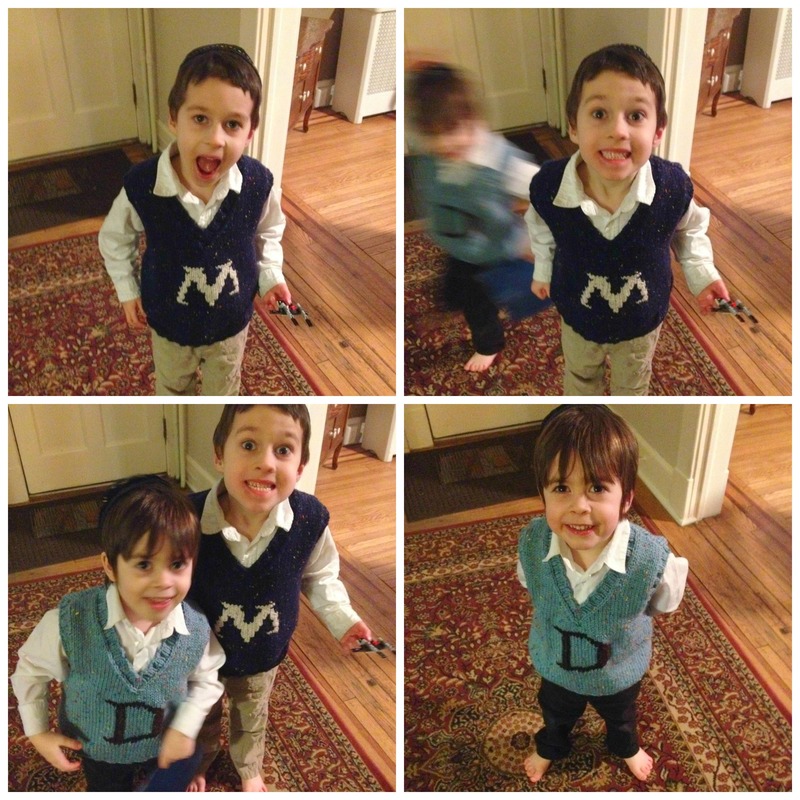 The wise and relatable Bibi of the Conscious Doer posted a picture of her twins in the most adorable vests. She also had a link to the woman, Jennie Santopietro, who makes the vests, and I contacted her to order some for my boys.They came last week in a beautifully prepared package, which was an absolute pleasure to open. I was already excited to receive the vests, but when I opened the package, I saw that Jennie had included a thank you card (so thoughtful! 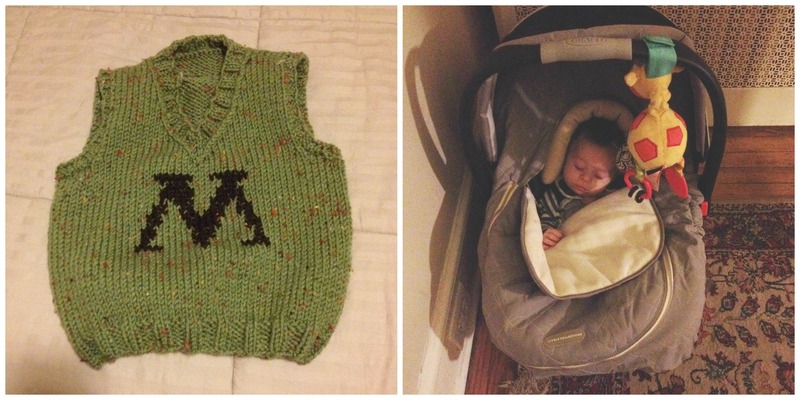 ), some knitting patterns (for when I start someday), and had wrapped each vest in a different color of tissue paper. The attention to detail and aesthetic was so delightful. And look at these vests! I received an email from Nancy at the Binah school, letting me know a) about the school’s existence and b) that they are having an open house on Tuesday night, February 10th in Lakewood, New Jersey. The school is a day and boarding school for 8th grade through 12th grades in Sharon, Massachusetts, and it systematically integrates school-wide project based learning with rigorous Judaic and secular studies (that’s what the Facebook page says). Checking out the school’s page showed me some interesting things like the girls making a rain garden, building bridges (metaphorical bridges) to other Jewish communities, doing code (awesome! ), and studying Chumash. They’re currently accepting applications for out of town students, and you can contact co-founder Michal Oshman at moshman@thebinahschool.org, or check out their Facebook page. Blogger and amazing human being Renee Schuls-Jacobson has been painting up a storm. I have one of her paintings in my kitchen. You should absolutely check out her page. And now for the self-promotion – I have two new videos on my YouTube channel. I’ve had some writing to procrastinate recently, which means I’ve been wildly productive on the music scene. This first video is the result of a couple of friends suggesting that I learn the music to the Cantina Band scene in the first Star Wars movie (like, the original). I looked online for some sheet music, but didn’t find any that satisfied me. So I transcribed the music from this video. And then I made my own video. Apparently, procrastination is my most effective muse. About a month ago, I read this poem by Rachel Kann. It’s been a long time since I’ve enjoyed poetry. A long time. Like ten years long. So when I saw that there was poetry on Hevria, I was kind of “meh” about it. But then I read her poems and I was blown away. Just floored. These poems – they moved me. I liked them. Looked forward to reading more. This gave me all kind of feelings, and one of the feelings was the desire to create. So I started working on a song about a month ago. Over the last couple of days I completed it. And I had a ridiculous amount of fun making this video. Because carrots are dancing! Hello! That’s it for now. I’m hoping to do a post like this about once a month, so if there’s something online you think I’d enjoy and would like to see here, just let me know. Have a great rest of your week! I almost died watching the bad lip syncing earlier this week. Hilarious! I know! I know! I am in complete awe of whoever is doing that. Skill and wit. SO funny. Beautiful! I have so many things I want to say about this post. First off, yes! I don’t think Jennie knows how delightful it is to open one of her packages. Every time I’ve ever received something from her (and we have been friends for 12 years, 8 of them living far away from one another). She has a gift for thought and care. I know exactly what you mean about everything moving so fast. I absolutely love your first video here. I imagine your house filled with music, and what gorgeous music it is. All of a sudden I feel jealous of your children. The dancing carrots are awesome too…I just loved getting to see inside your home with the children in the back ground and the foreground. Creating as a mother is always in and around children. What beautiful moments. Thank you for sharing your art with all of us. You can just feel the love and care she puts into it! It’s wonderful. I feel like, as a musician, I don’t fill my house with *enough* music! 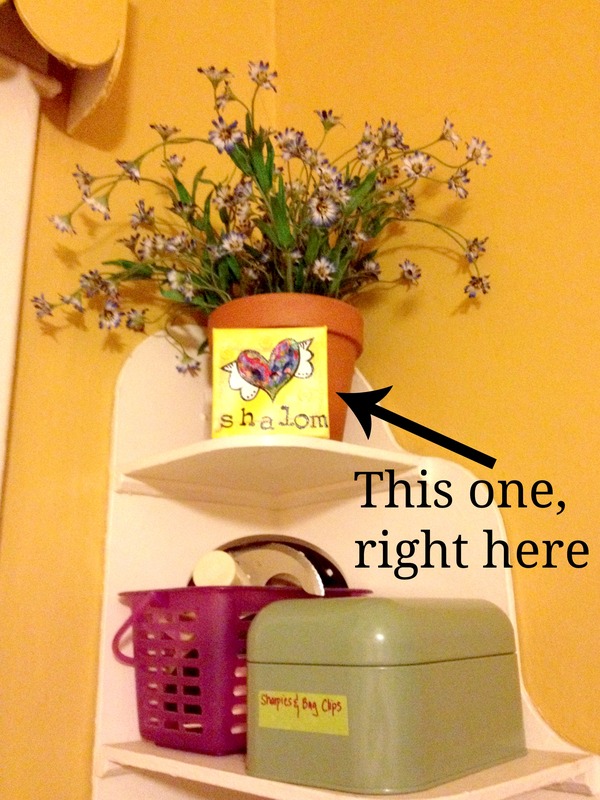 It’s always a balance between my art and my housework, but I hope my children are getting enough of the art side. :) I think it’s so important for them to see me doing things I’m passionate about. Thank you for your beautiful words about being able to get a peek into our lives. I felt the same way with your identical/fraternal reveal video. It was so well done! Thank you! It was so, so much fun. The Cosmic Carrot video is fantastic and I love your song! You definitely put a lot of effort into it, and I can’t believe how neat those carrots look. Thank you for sharing your gift! Thank you! it took about an hour and a half to take all the pictures of the carrots. I found it really meditative, mostly. That would be so fun! I’d love to spend a little time in Detroit (and you’ll have to come to us sometime, too! ).